This sounds like a creamy, fruity salad that we used to call Ambrosia. My mom would freeze it in round containers and then maybe slice it? 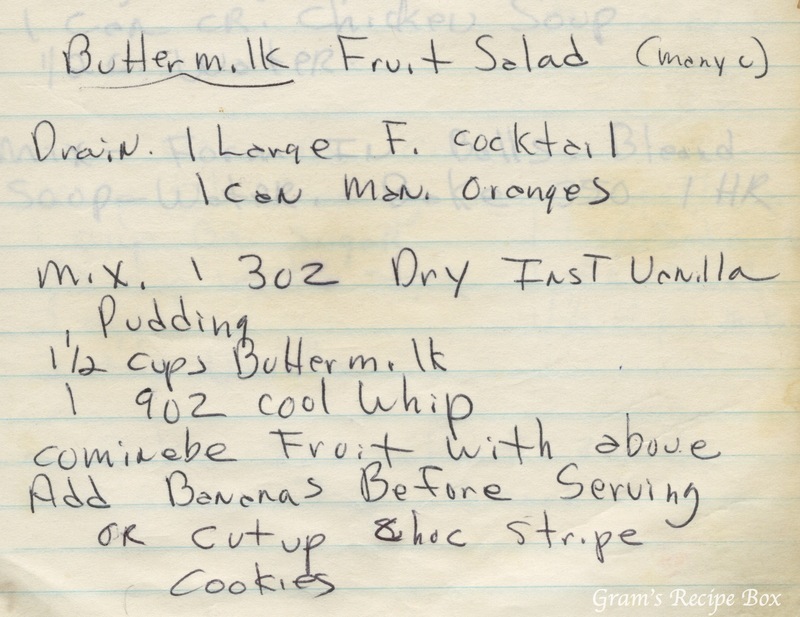 It’s the sort of “fruit salad” found at backyard cookouts throughout the 70s. P.S. Happy 57th anniversary to my parents and Happy Birthday to my mother-in-law! Sounds more like dessert than salad! Two thumbs up! This actually sounds better than typical Ambrosia–too much coconut and, I think, sour cream. I’m guessing that real buttermilk would be much better than my standby of vinegar and milk. Might have to try this!